Yesterday I worked all day and had a friend coming for dinner. I wanted to make something healthy, tasty and fast. From beginning of preparation to end of cooking this took about 50 minutes. She loved it and asked me for the recipes. With everyone being so busy this time of year, I decided this would be the perfect recipe(s) for December. Chicken – Use whatever pieces you prefer. I used chicken thighs and got 6 so I would have some leftover. If using breasts with bone in, you might need to cook them about 10-15 minutes longer. In a baking dish, rub a bit of olive oil on the bottom so the chicken doesn’t stick. Place chicken in dish, skin side up. Drizzle lemon juice first then olive oil over chicken. Put white wine in dish around chicken. Sprinkle Herbs de Provence over chicken, then salt and pepper. Set aside. 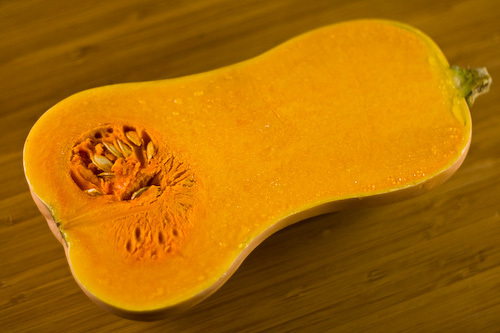 Place squash in a square baking dish. Add all the remaining ingredients and stir to coat. Preheat oven to 350 degrees. Place the squash in the oven and start baking. After 10 minutes, place the chicken in the oven next to the squash. Continue baking for 35 minutes. Turn broiler on and broil for about 5-8 minutes until both squash and chicken are beginning to brown on top. Remove from oven and serve. While the squash and chicken are cooking, you can prepare the vegetables. In a medium sauté pan, heat the butter and olive oil. Add the shallots and garlic and sauté on medium heat for 5 minutes or until they start to soften. Add the bell pepper, salt, and sherry and reduce heat to med/low. Continue to sauté until the squash and chicken are almost done. (This will make the bell pepper really sweet!) Note: If the pan is starting to become dry, add a bit of water and turn heat to low. A few minutes after you have put the oven on broil (for the squash and chicken) increase the heat on the pan to medium and add the cherries, water and chard. Cover and cook for about 5 minutes, stirring occasionally. 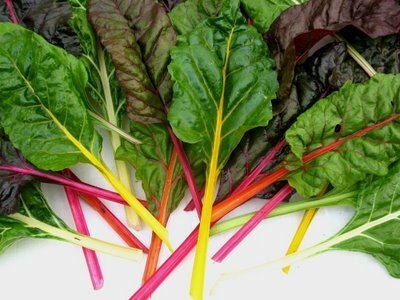 Watch to make sure the chard doesn’t over cook! You want it to be a nice vibrant green when done. Serve.